SanDisk Sansa Clip Zip 4GB MP3 Player - Purple NEW. Condition is New. Shipped with USPS Retail Ground. This is a nice very portable MP3 player that can go anywhere clipped on you to allow you to listen to your favorite music. It has been tested and works perfectly. It looks cool in the red a well. Imagine listening to your favorite music on this mine MP3 player. Fully functional with NO problems. Plays content from nearly every source (MP3, WMA, secure WMA, Ogg Vorbis, and FLAC). AAC for DRM-free iTunes compatibility. Plays music, audiobooks, and podcasts. 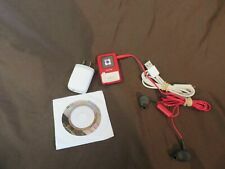 SanDisk Sansa Clip Zip 4gb MP3 Player Purple No Micro Card. Condition is Used. Shipped with USPS First Class Package. The music on it doesn’t work as their subscription has run out, but the item is fully functional. Sticker ghost on the back, minor scratches on the screen. Comes with charger. Plays content from nearly every source (MP3, WMA, secure WMA, Ogg Vorbis, and FLAC). FM radio and Voice Recording. Health & Beauty. We apologize for your inconvenience. Sporting Goods. 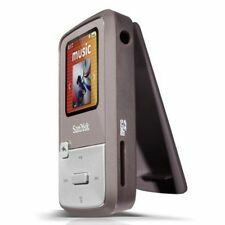 SanDisk Sansa Clip Zip 4GB Rockbox SDMX22 FM MP3 Player Installed Dual Boot. Condition is Used. Shipped with USPS First Class Package. And 4GB internal storage. Players almost has no scratches on it, Sound is nice and clear.